There are many things that I love to do, but this weekend I got to do two of my very favorite things...and both were with Mommy. One is to help & give to others and the other is to play. I started out my weekend by helping Mommy make a bunch of new bandanas for the shelter pets that she photographs every Saturday to help them get adopted. We ironed material, cut out triangles in different sizes, and folded all pretty to bring to the shelter. 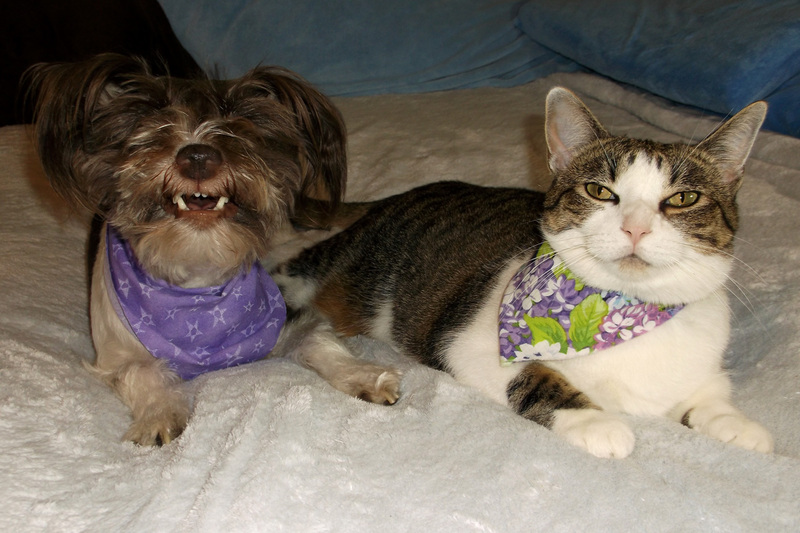 My cat sister Noel agreed to help me try some of them on, because Mommy needed to see how they would look. Modeling is hard work too! Noel made hers look really good. I look a little like a cowgirl in mine, but that's fine with me. Mommy said I looked a lot like the famous actress Dale Evans. I just about blushed at such a compliment! Mommy went on to the shelter later and said that all the dogs and cats looked GREAT thanks to our efforts. Noel and I felt pretty happy about that. What a great way to start off my birthday week! Yes, my birthday is fast approaching and I have been counting down the days until I turn 5 years old on Wednesday, December 6th 2012. Can you tell I am excited?? I just can hardly wait! We will be celebrating it next weekend, but I believe in getting the party started early. 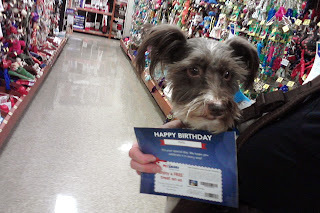 I had received a special birthday card from Petsmart that had a 'free toy' card in it just for me. Can you believe it? I felt pretty doggone special and couldn't wait to go spend it at the store. 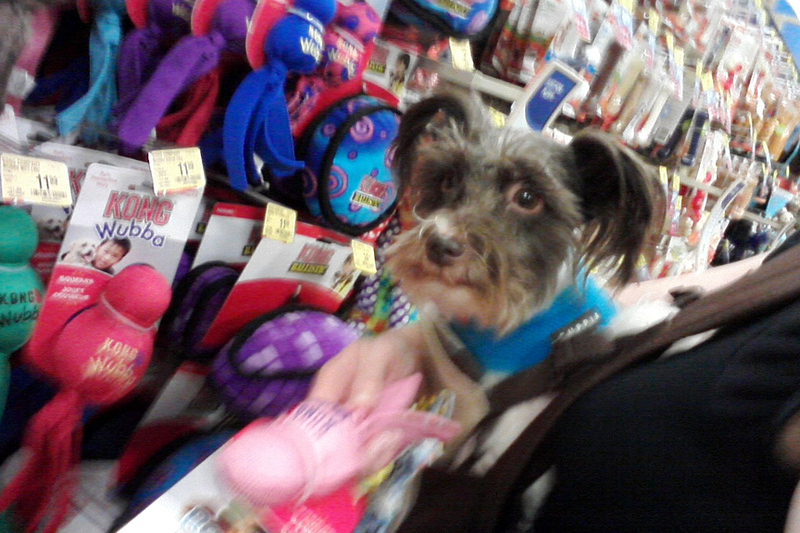 So, Mommy, Grammy and I drove down to the nearest Petsmart with card in hand to find me the best toy ever. 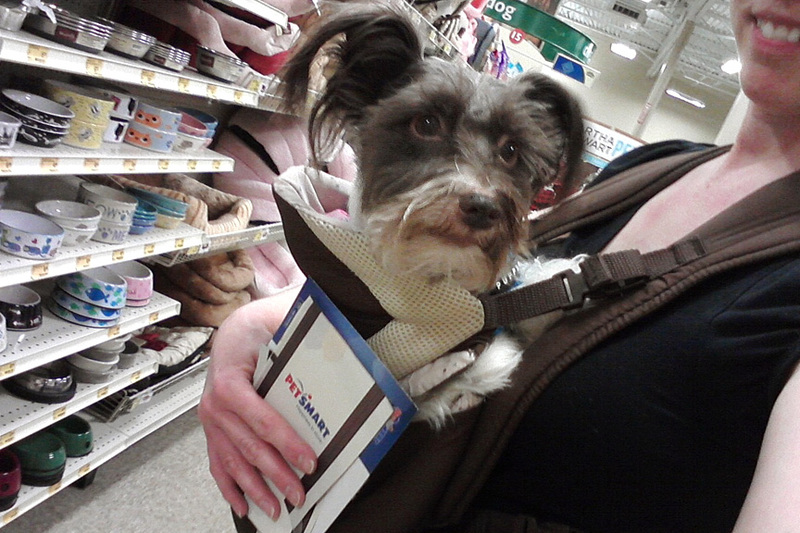 I rode in my carrier attached to Mommy and I couldn't wait to start looking. When we first got there, we looked around a bit but somehow ended up in the cat aisle. "Mommy, I don't think I'll find what I want here." There are lots and lots of wonderful toys in the world. Balls, squeaky toys, Frisbees, indestructible dragons, fuzzy snowmen, loofa toys...but one toy stands above all the rest for me. 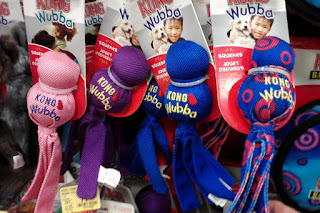 If there was one 'holy grail' toy for a little Pixel Blue Eyes, it would be the Kong Wubba. "Mommy, Mommy! Here they are, right here!" Look at some of the color choices I had. WOW!! Kong Wubbas are one of the most amazing toys ever...did I say that already? They literally last for years. The first one I ever got was about 3 years ago, and I still have it! They last for years and never wear out, except for my red one that lost it's squeak, but it's still a blast to play with. I can run with them, shake them like crazy, catch them in mid air, and play 'pull the toy' with Mommy. Now....which color do I want? If you guessed I would pick Pink, you were totally right. See, I already have a red, blue and purple one, so pink seemed like a perfect choice. The moment we got it home, I begged Mommy to get it out of the packaging. When she gave it to me, I grabbed it quicker than you can say Rumpelstiltskin. "Come on Mommy, let's go play right now!" First we played 'Pull the Toy Tug-of-War' together with my PetSmart free birthday toy. 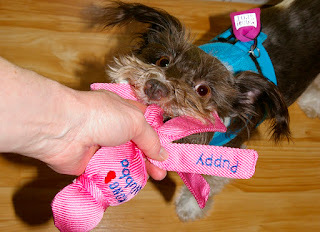 Mommy thought it was cool that my Kong Wubba had the word "Puppy" embroidered on it. None of my other Wubbas have that, so that just reaffirmed that I picked the right one for me. After all, I am still a puppy, even if I am turning 5 yrs old. Then Mommy threw it in the air a bunch of times for me because she knows how much I LOVE to catch my toys. This was my very best catch caught on camera. 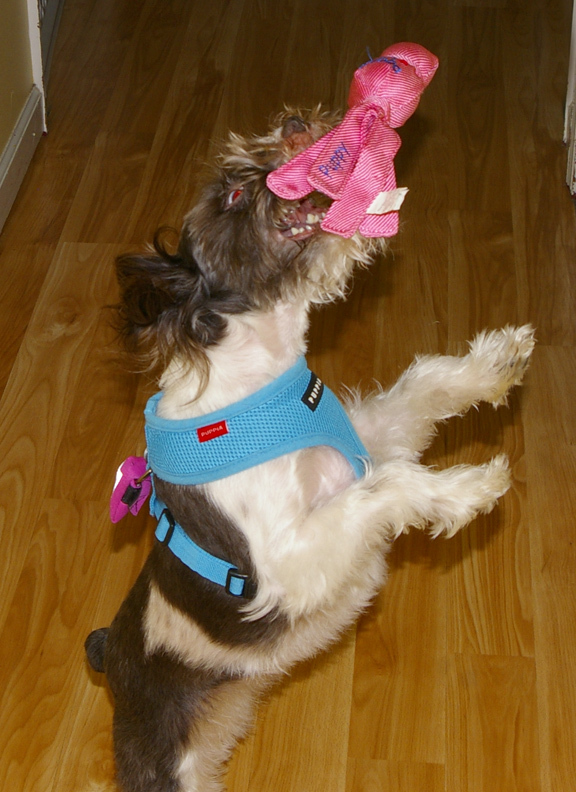 I'm pretty sure I jumped a good 5 feet in the air to catch it, BOL! Not bad for a soon-to-be 5 yr old little girl! I just played and played with it. Our next order of play business was to have Mommy throw it down the hall. I'd run like the wind to go get it too. My little paws flew like lightening down that slippery floor, almost acting as a hover craft at some moments where I barely touched the ground (or so Mommy says). We had so much fun! By the end of our fantastic play time with my new Kong Wubba birthday toy, I was completely spent. 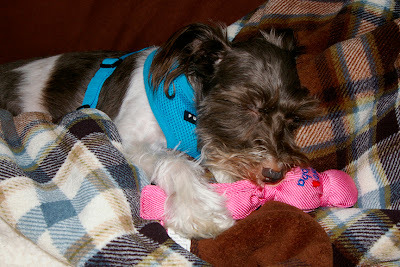 Mommy caught me on camera, after I fell fast asleep holding my new toy. I told you they were special. Goodnight my dear sweet friends...I am super exhausted from such fun with my new toy. Goodnight Kong Wubba...thank you for being my new toy. 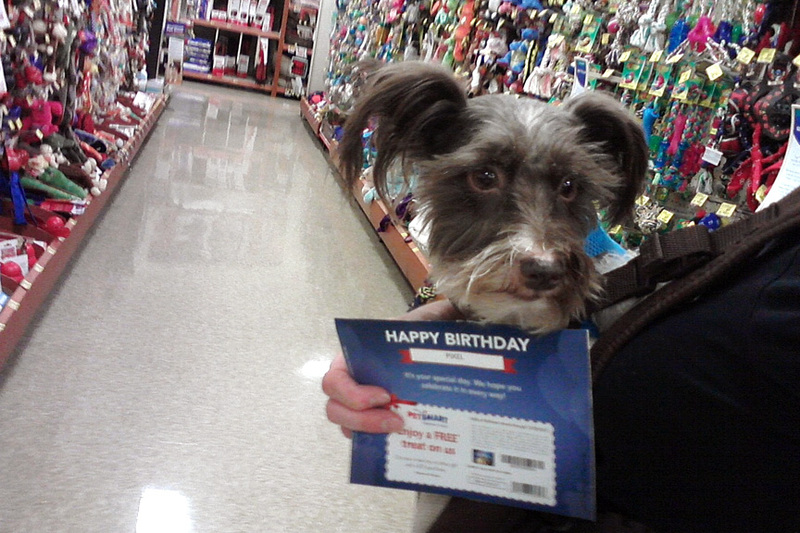 Thank you Petsmart, for sending me a birthday toy card! I am one lucky Puppy! 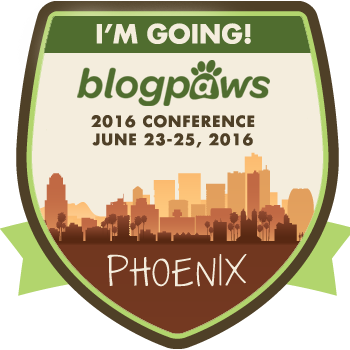 You'll have to go see what my friends have been up to this past weekend in the Monday Mischief blog hop. Have fun exploriing!! Happy Early Birthday! 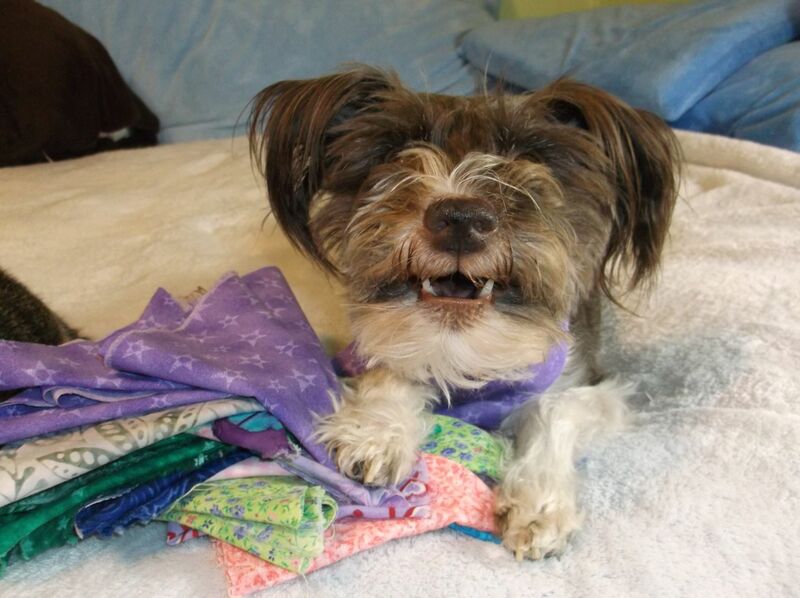 You look so beautiful modeling that bandana! i think you need to teach my brother about 'giving to others'-he has a real hard time with that one! Hiya Pixel..... I've been wondering how you are my furiend!! You look in fine form for "5" and tell your mom her dumb phone takes a GREAT picture - you looked so comfy in that holder.... if I tried that mum says she would need serious orthopaedic work on her back ...BOL! Still - HAPPY BIRTHDAY my pal.... and you have great choice in presents - close call about the sweater though....I was holdin' my breath hopin' they wouldn't get you one of those!!!! 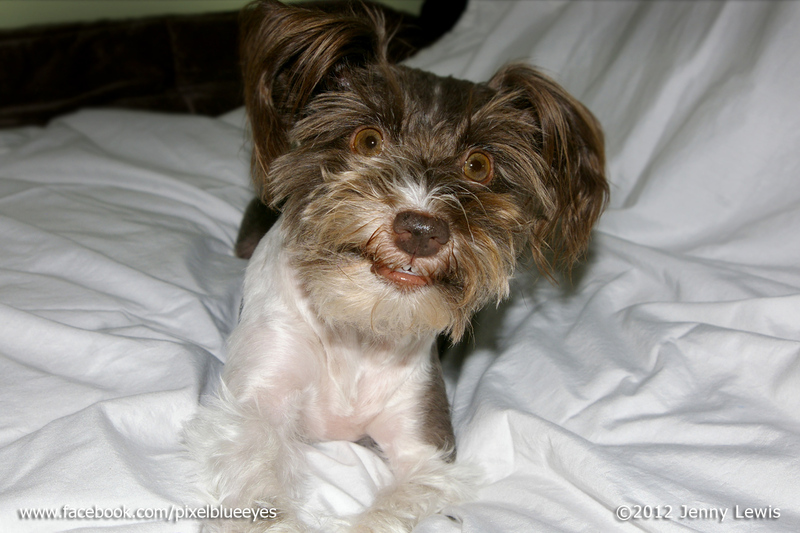 PeeS: How is your "tail" now??? Hey Pixel Happy Birthday! Mine was Nov 27th. I just turned 9. I have been busy visiting nursing homes but I come back every day looking for a blog from you. I enjoy them so much. My Canines For Christ group just made up some Christmas Gift baskets for the Police dogs in our town. 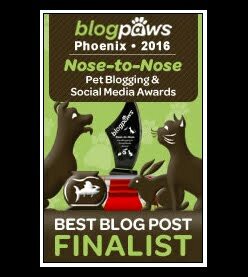 I hope you get a chance to check out my blog adventures too. Love M.J. Happy birthday, Pixel! You look super awesome! A belated Happy Birthday Pixel. 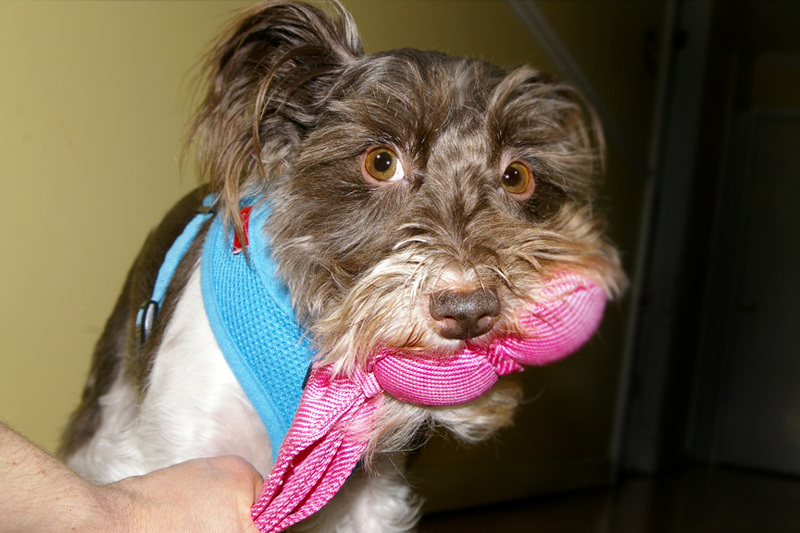 Glad you got your Kong. Joey is the only Brazilian dog with a red Kong. Thank you to your mum and you for making the comment on our blog. It cheered us up because so few people bother to comment. Thank you. We don't have much time to comment on others because there are 26 dogs here and just me and hubby to look after them all. You made my day.